I am a landscape, mixed media and marine artist based on the west coast of Scotland. I am inspired to paint by the light and the beauty of where I live. On Mayfield Road, in Edinburgh is a great wee gallery called the Stick Factory and, earlier this year I was absolutely delighted to be asked to give them some work to display. I met with Mike, one of the owners of the gallery in early February and discussed giving him some of my work to display. It was quite a tight schedule and I didn’t have a lot of time to create new work. I had already committed to my anniversary promotion, wherein I launched my Etsy Shop, and uploaded 20 paintings from my village and surroundings, one a day for twenty days at only £20. That promotion is now over, but I wrote about why I was doing it previously on my blog. I loved doing it, I learned loads and am now comfortable with selling my work online in a more formalised way. “I live in one of the most beautiful places in the world and, as a landscape artist I spend a lot of time, sketching and painting in this place. This series of paintings is titled from Letterewe to the Isle of Skye as this is where they were painted. My village is Lochcarron, which runs like a ribbon along the Northern shores of Loch Carron. At the head of the loch is Strathcarron and the flat valley and raised beaches left by the last ice age. From my home I can be at Letterewe, within an hour, as long as I don’t keep stopping to sketch or draw or just look at the beauty all around me. This road takes the driver through Beinn Eighe nature reserve, the mountains of Liathach and Beinn Alligin dominate the views and are reflected in the sea lochs along the route. Letterewe is near the centre of Loch Maree, an inland loch that is steeped in myth and legend and that is considered one of the most beautiful in Scotland. To the West lie, Gairloch and Poolewe, to the North is Ullapool. Heading South again, gives a different vista. Back past Loch Torridon, Loch Kishorn and the Bealach na Ba. Past Loch Carron and on the Road to Skye, the driver can stop at any number of view points and look back at Fuar Tholl and towards the mountains of Strathconan, or look ahead to the Cuillin range on the isle of Skye. This scenery is primordial. Man is inconsequential in this landscape. And yet there are wee houses sheltering beneath the hills, the trees are distorted by the strong winds and the roads fringed by broom and gorse. This is the land of the storms and of gentle breezes. This is the landscape that I try to capture in my paintings. It’s been a very busy few weeks again – it always seems to be these days! So I’m later than I hoped to be with an update of Etsy project. 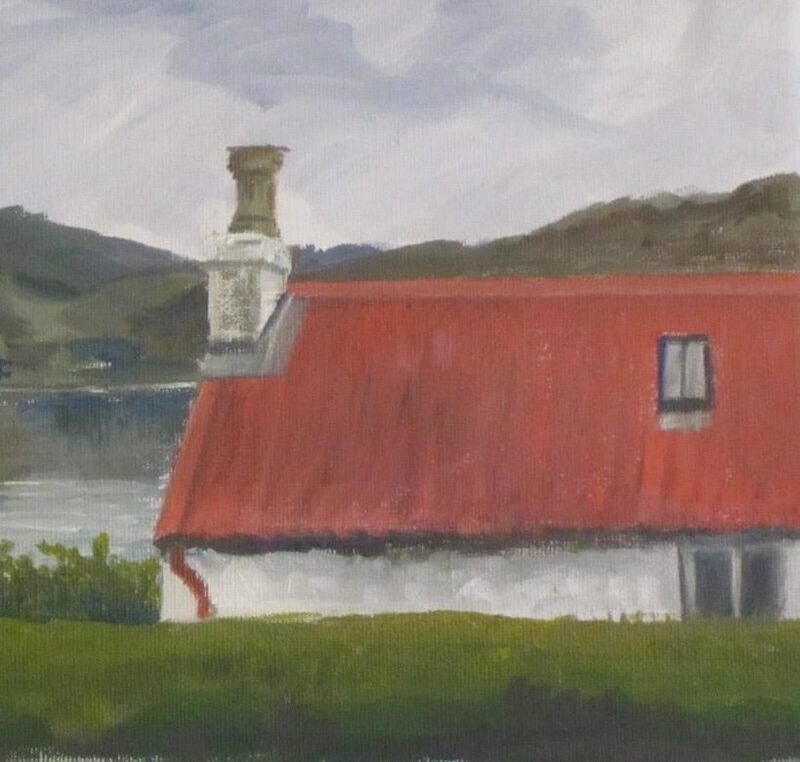 I wanted a way to celebrate the Twentieth Anniversary of my move to Lochcarron, so I painted a series of small study paintings and uploaded them to my etsy shop. I’d had the etsy shop for a while, but had never sold anything from it, so I wanted a way of trying it out and something that would keep me motivated to post regularly. I was also very keen to keep the costs low. I thought that £20 per painting would be a good introductory offer. Normally a painting at approximately this size would sell for a lot more than this. But I wanted to make this celebration special, I wanted to say thank you to all the people who have supported me, both locally and online. However, because I was selling my paintings at such a low price I couldn’t afford to offer free postage, which is what Etsy recommends. In future, I will do that, as I think it would make life a lot simpler. Because it was a special series of paintings I also decided to do the paintings to fit a 10×12 mount. I really liked them at this size, it seems to be a good size to work with. I really like this size for a landscape study and I know there are several images that I want to work up into larger paintings. It’s been such a postive experience. It’s helped me look more closely at some very familiar scenery, that I almost rediscovered. A number of people locally really enjoyed the project and I’ve had lots of folk come and chat with me about it. I’ve increased my followers on various social media platforms and I sold 15 paintings so far (13 online and 2 as a private commission) and I will probably have some work left at the end of the project which I can exhibit locally. Now that the anniversary project is over I am moving on to the next exciting arty adventure. More about that every soon. It’s day ten of my project to upload a daily painting to my Etsy shop in celebration of my twenty years in Lochcarron (I wrote more about my reasons behind it here) and I can’t believe I’m halfway there already. Just ten more paintings to go. It’s been an interesting experience and quite a challenge but I think that uploading an image a day has been good for me and helped me think and act more professionally. I try to be in the studio every day, for at least a couple of hours. I’ve been out and about in the village and surrounding area, sketching, drawing and taking photos to use later in the studio. I’ve tried to balance the views of the village that I’ve included amongst the twenty paintings, but this area has so many beautiful places to paint that I’ve really been spoiled for choice. I’ve sketched my choices and then blocked out each painting. When I’m happy with composition of each piece I’ve added details and finished the paintings. When I decided to do this project I bought white mounts and cello bags and when each painting is finished I’ve popped it in a mount, put a backing on it and then put it in a cello bag ready to be posted. I’ve also had to be quite organised with social media and each day, after I’ve added that day’s image to the Etsy shop I’ve shared the details on my social media sites. My daughter gave me her old iphone, which has really helped me with my Instagram images, as no matter what I did with photographs before, they always seemed to come out blurred on my old phone. I’ve tried to have several paintings finished ahead of time and managed it so far, again, that has been a learning curve and has helped me really focus on what’s important in running an online business, what I need to focus on and the discipline needed to do something like this. I’ve got a lot of exciting things coming up this year, most of which I can’t share yet, but this project has given me the kickstart I need I think, to help keep me focussed for all the work I have ahead of me in the next few months. It’s great to have something to keep me sketching, hence the fact that I signed up to the #30daysketchbookchallenge. I haven’t missed a day so far, but I’m cutting it fine to get something up tonight. I’ve been posting every day on my Instagram page, if you want to follow my progress. However, I’ve also had several other deadlines this week, including wanting to drop off some art to the Twitter Art exhibition curator (TAE19), a meeting of the art group I belong to (we met to do some sketching and to hang a mini exhibition at a local venue) and an arty trip to Inverewe Gardens. I also have two months left of the online certificated course that I am doing with the Botanical art department at Edinburgh Botanic Gardens. Great fun but really challenging and the deadlines are non-negotiable. I uploaded my latest assignment earlier this evening. I’ll post more images from this course and share a little more about it in the next few weeks. Then there’s the The 100 Day Project which isn’t starting yet, but which I’ll be working towards over the next couple of months. January is such a difficult month. After the Christmas break it can be a real challenge to get back to work. Deadlines seem so very far away, so it doesn’t seem like to much of a problem if you leave things for a day or two, then, all of a sudden your deadline is just a month away (I’ve been in THAT situation more than once!). But this year I have a lot of deadlines – more about those in future blog posts, so I can’t allow myself to slip behind. So to get me in the right frame of mind I signed up to the 30 Day Sketchbook Challenge via this group on FB. It’s been an interesting experience so far. Every day participants are given a new prompt, which you have to sketch. I’ve found some prompts really fitted well with my own skills and I really enjoyed doing something, but other days I have found it much harder to do something based on the prompt. The group is full of glorious images, there is so much inspiring work and some much imagination. The particpating artists are from a wide range of genres and experience levels and they’re really supportive of each other. It’s also great at a time like this, when there is so much bad news and so many worrying things happening, to have a FB timeline that’s filled with wonderful images. If you are interested in seeing more, check out the FB group (linked above) or look for the hashtags #30daysketchbook2019 and #30daysketchbookchallenge on Twitter, FB and Instagramor you could also have a look at #sketchjanuary on the same sites. I can’t believe that it is the end of the year. That my last post was in May, that I’ve not managed to post regularly, because I’ve been so busy, painting. When I first came back to art I set up a Facebook page and then a Twitter page. I shared my journey and met lots of new people. Got advice and support and offered it too. We closed the gallery in June, a bittersweet occaision. Then my friend Aileen and I worked towards an exhibition at the wee Bothy Gallery at Balmacara. I also exhibited in Inverness, Ullapool, Thurso, Skye and Nairn. I’ve blogged a couple of times about being inspired by a course I did at Inverewe Gardens way back in March. The course was with Edinburgh Botanic Gardens and I loved every moment of it. So this Autumn I was delighted to be accepted on the certifcate course, once again with Edinburgh Botanics. The course has taken me right back to basics and I’m still working through it. I also have a couple of really exciting projects coming up this year, and I promise to try and update regularly and let you know more about my art adventures. In the meantime, I’d like to say thanks to everyone who follows me on social media, all those who follow this blog and who has offered advice and support in 2018.